We do a broad variety of tests and benchmarks here at PhoneArena, including camera comparisons, which happen to get a lot of attention from our readers. That's no surprise at all, if you ask us, since smartphone cameras have evolved substantially over the past few years, and people are really curious as to how they perform. Our last camera comparison was of the blind variety – we presented our readers with samples from two highly acclaimed smartphones and asked them to pick a favorite. Then several days later, we revealed that the handsets used in the shootout had been the LG G3 and the Sony Xperia Z3, of which the former got the majority of the votes. And rightfully so as LG's flagship did perform a bit better than its counterpart, and in the paragraphs below, we'll go over how the two handsets' cameras stack up against each other. For the purpose of this camera comparison, we took several sample across a variety of conditions, including different outdoor and indoor lighting conditions, shooting at night, and taking close-ups. No fancy modes were used in any case – the LG G3 was in its stock configuration, with only the Auto HDR mode turned off, while the Xperia Z3 was configured to use Superior Auto mode at a 4:3 aspect ratio. Here's what we have to say about the results. The first sample we'll comment on was taken on a sunny afternoon, right before sunset. Both phones have managed to reproduce the sun's warm glow somewhat faithfully, although the photo from the G3 has a slight greenish tone to it, while the Z3's image, albeit a bit blueish, has a truer-to-reality look. On the other hand, LG's flagship has done a better job at preserving details, while the Z3 has them smudged around edges – take a close look at the building's brick wall to see what we mean. However, we see some strange blurring all over the left-most side of the G3's image. We aren't sure what caused it and whether it is a glitch or not as the G3's camera doesn't normally produce such imperfections. We suppose you've noticed that the Xperia Z3 has captured a much wider frame than the LG G3. That's due to its shorter focal length – 25mm vs 29mm for the G3 (both figures are 35mm equivalents). This gives it a wider field of view, which is an advantage, especially when shooting in tight spaces. This frame, which was shot on the same day, demonstrates how the LG G3 and the Xperia Z3 sometimes have a different say regarding color reproduction and white balance. LG's flagship has retained that warmness we mentioned above, while the Z3's image looks too cold and lifeless. We'd also say that the G3 has captured clearer details, although the aforementioned blurry glitch is still present. This scene is ideal for examining how well the two cameras capture details in non-optimal light. The only source of illumination is a single light bulb positioned about 3 feet above the ornaments. Again, the LG G3 has done a better job at it, while the Z3 has produced a bit smudgier details. Colors are also more accurate in images from the G3, while the Z3 has produced colder, more lifeless colors. That's why the snowman's cap appears pink in the latter's photo instead of red, as it does in the G3's photo. And here's a close-up. Detail-wise, both phones have performed less than ideally in this particular scene, but at least their images look pretty decent when scaled down. Colors are equally accurate – the scene was taken on an overcast afternoon. Overall, this round is a tie, but we were hoping to see better results from the two high-ends. This scene was taken on the same gloomy afternoon as the previous shot. All in all, there are differences in image quality between both phones' images, but we'd say they're nothing major. Thanks to its higher resolution, we suppose, the LG G3 has captured details in better clarity, but its advantage is only slight. Once again, we get to see the Sony Xperia Z3's wider field of view in action. Even though both samples were taken at identical distance from the subject, the Z3's camera has captured a much wider area than that of the LG G3. 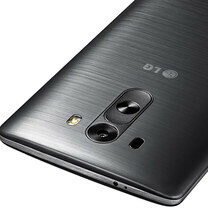 Furthermore, the photos demonstrate how in trickier light conditions – the not-so-bright lights in the hall of our office, to be more specific – the LG G3 tends to soften the details in its photos, while the Z3 preserves more of them at the cost of leaving more digital noise behind. This scene was taken in complete darkness to test the performance of the two phones' LED flashes and their ability to focus in low light. We experienced no focusing issues, and the LEDs filled the scene with light pretty well. Speaking of LEDs, we have to point out that the LG G3 uses a dual-tone LED flash, which allows it to produce a warmer light. In our opinion, it looks more natural and pleasing to the eye compared to the Z3's single LED. But there's more about this frame that we want to point out. Looking at the EXIF data reveals that the settings chosen automatically by the two cameras vary quite a bit. The G3's photo was taken at ISO100, while the Z3 shot the frame at ISO1000. This explains why the latter's image contains more digital noise. On the other hand, the G3 had its exposure time set at 1/18, while the Z3 took the shot in 1/50 of a second. Apparently, LG's flagship does not hesitate to set longer exposure time in the dark and to compensate for accidental vibrations using its optical image stabilization. And now for something completely different – a shopping mall's well-lit hallway. One of the first thing we noticed after putting the two frames side by side was that the otherwise white walls appeared greenish in the Z3's photos. Other than that, we don't see many quality differences between the two images. Here's a tricky one. This scene was taken against the sun to see how the two cameras deal in high-contrast scenarios without relying on HDR mode. Neither phone would win any awards with its shot, but they did not perform poorly either. They just took slightly different approaches – the LG G3 did not expose the frame as much, which is why tree branches are preserved better. On the other hand, the Z3 exposed the image a bit more to gain more details in the shadowy areas. Lastly, here's a night scene, the kind of which would be a challenge for any cameraphone. Don't mind the difference in aspect ratio – we accidentally left the Z3 in 16:9 mode instead of using 4:3. Anyway, we're once again reminded of the way the G3 handles details in low light. That's why despite its higher resolution, its image is, ultimately, lacking in fine details. Nevertheless, we think the G3 took the better photo overall. The Z3 could not capture colors as accurately, and its image appears a bit unnatural as a result. Sony is highly acclaimed for its digital camera sensors, yet for some reason, it is unable to produce a smartphone with a camera that can wow us. Despite its higher native resolution, despite the fact that it came out several months after the G3, the Sony Xperia Z3 and its camera simply lag behind the LG G3 in real life. LG's flagship was on par or performed better than its counterpart throughout our camera comparison, producing better-looking details and superior colors in its photos. Having this in mind, that our readers chose it over the Z3 in our blind camera comparison does not come as a surprise. We're not trying to say that the Sony Xperia Z3 has a bad camera. Quite the contrary – its shooter performs well enough for most users' needs. But it leaves room for improvement, in our opinion. Could it be the software holding it back? Or is it the optics? The lack of OIS? We can only guess. Still, we have to highlight one advantage the Xperia Z3 had over the G3 – its wider field of view. Undeniably, this a valuable perk when shooting at a close distance from the subject. So here's to hoping that Sony will take its flagship camera to the next level for the Xperia Z4. In the meantime, keep an eye out for our upcoming camera comparisons. Your grammar is a joke. Or can you only think in the past-tense? Sony is a big company with a huge amount of knowledge accumulated over time and big potentials. Blame the Japanese economy that is in decline the last 20 years. They make the sensors for most of the big companies, don't they? Even Samsungs's Note4 that's the best camera. Anyway, I'd give scenes 4 and 6 to the Z3. It's Christmas after all, Merry Christmas everybody! Well maybe if PA would just ONCE try the manual mode without even changing any settings at all, they would have a fair comparison and not this bullsh**. Seriously, anyone who can randomly slide a white balance slider around can manage to get better results than almost every mobile camera out there. Not to mention, most people who get the Z3 would have the slightest technological inclination. 90% of users are just going to pull out the camera, point and click. While I totally get what your saying, the camera should be accurate from the start and adjustments should only need to be made if the user wants to fine tune or adjust the scene... not every damn time u use the camera. Sony makes the camera modules for many of today's top phone cameras including the spectacular one in my Note 4. The problem is software, which could be updated easily if Sony felt like it. Not 100% true. The LG I would say edges out the Sony, but just barely. The G3 seems to be better for autofocus, but otherwise the best camera depends on the situation. Sony seems to have an issue with brighter scenes while the LG had issues with darker scenes. LG would best Sony on a Sunny day while the Sony would have the edge on a Cloudy one. Sony can come up with a 1 000 000 Mpix camera and it's still would take trash photos. *it would still Sorry, I was in a hurry. I think all manufacturers are working to improve their cameras, but don't know why, I went back and checked pictures taken by my old SonyEricsson K800 and Nokia N79 and they looked better. Have you read the article completely? Z3's photo have only 8MP since it is taken with SA mode. I agree that they need to improve the SA mode. But your comment is stupid. and samsung still have to catch up. How?, they've won almost every awards here on PA. The Note series is BEAST. note 4 's censor is made from Sony. ... That still doesn't explain why you think they have to catch up. If Samsung gets better results from Sony sensors than Sony itself does, your logic should work the other way around. I don't even know why you brought up SS in this article that's specifically between the Z3 and G3 anyway. Sorry PA, sometimes you're right, sometimes you're wrong, in this case mere difference in color temperature biases isn't a point to 'outpace' something. I'm also laughing at the justification of picture 3 that "has captured clearer details" yet isn't even taken in focus. Everyone beside few sony die hard sheeps. Its been known for the last two years that sony cant make a great camera in their phones when compared to competition. They produce the best sensors yet they have no idea what software optimization means. I Want Phonearena to have a comparison Between Xperia Z3 Manual Mode and The Auto Mode. Personally I'm going to buy this phone , but all these photo comparisons made me confused ! If you agree with me , give +1 to my comment . Its a phone. Of course everyone will compare the auto mode. You have camera on your phone to capture that unexpected moment not to use your phone like a DSLR and go through manual settings. 99% of world population have no idea what exposure, ios, etc means and thats why you will never see manual mode compared in any smartphone. People who buy DSLR either want to learn to use them manually, or already know. People who buy phones want to use the camera in auto simply cause they dont know and don't care for manual modes. Thats Right . Oh I've got a question . If i replace sony camera app with an other app like Google camera , will it fix issues with sony camera or not ? Yes it does. I use Google Camera. Excellent pics on my z3c. Superiour auto is bad. Also my camera starts up with manual, not superiour auto (u can choose what to start up). Can you explain how to launch in manual mode? I assume you mean by pressing the camera button, or sliding up from lock screen? I dont really understand how people are thinking Manual mode means "tweak every setting every time you take a shot" You hit manual mode, set it up for how youd take MOST of your photos, then forget it. If you WANT to tweak it each time, okay, but you dont have to. I also love the Sony camera widget, where you can make one of the selections manual mode.. so it launches as fast as regular mode would by holding the button down.